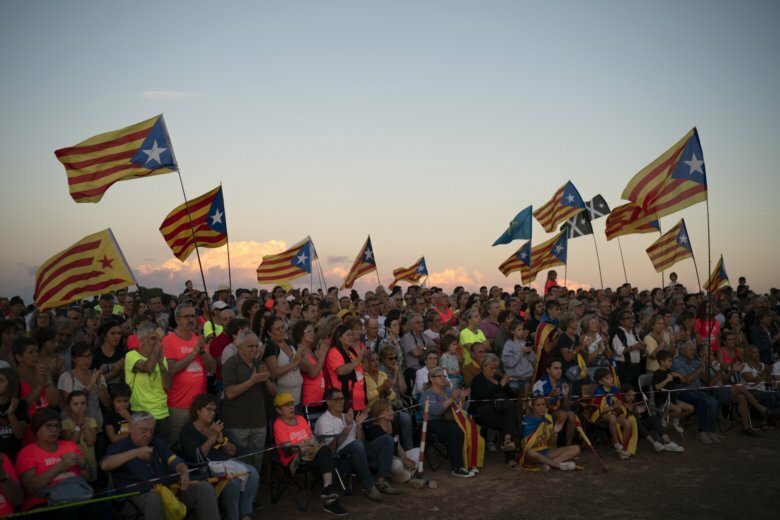 SANT JULIA DE RAMIS, Spain (AP) — Activists blocked railway lines, students skipped classes and supporters of Catalonia seceding from Spain marched in large numbers Monday to mark the anniversary of a referendum that was part of a thwarted bid for independence last year. The evening march in Barcelona, the region’s capital, drew what local police estimated was a crowd of 180,000 people. A spontaneous spin-off demonstration produced a tense face-off between police and lingering protesters, capping a day of noisy and largely nonviolent demonstrations. The anniversary of the event that sparked Spain’s gravest political crisis in decades was marked by a fractured Catalan independence movement amid delicate talks on the region’s future with the country’s the center-left Socialist government. Last year’s Oct. 1 referendum in Catalonia, ruled illegal by a court, was stopped by Spanish police and failed in its bid to produce a separate Catalan state. For many Catalans, the vote has become a symbol of their long fight for self-determination. As part of the one-year observances across the region, activists blocked roads and other major transportation routes while college and high school students boycotted classes and made emotional speeches at mass protests. The evening march turned downtown Barcelona into a colorful parade of banners and flags. Several thousand people attended the follow-up street demonstration outside the National Police headquarters and hurled insults and small fireworks at riot police on the sidewalk. The standoff continued late into the night. Outside the Catalan parliament, protesters pulled apart police barriers and held a sit-in as police reinforcements took up position, Spanish media reports said. In Girona, north of Barcelona, demonstrators threw colored powders at police and pushed down barriers. They shouted “Freedom for political prisoners,” a reference to the separatist leaders who have been in pre-trial custody on rebellion and other charges for nearly a year. Maria Vila, a protester who was placing “Republic under construction” stickers in one of Barcelona’s main thoroughfare, said she wanted to highlight last year’s violence and demand more progress on secession. Members of the regional Catalan government returned to Sant Julia de Ramis, the northern town that has become a symbolic place for separatists because one year ago police stormed into the local school to prevent people from voting. Torra has asked the government of Prime Minister Pedro Sanchez to authorize a binding vote on secession, and also to release the nine separatist leaders who are in pre-trial detention on rebellion and other charges. Dialogue between the regional and national administrations has so far delivered some economic deals for funding the region. But the talks are bogged down by internal discord among separatists on the best strategy for going forward and the weak parliamentary support for Sanchez’s minority government. Government spokeswoman Isabel Celaa said Monday that last year’s police violence was “a mistake” and said it damaged the country’s reputation. Aritz Parra reported from Madrid. Video journalist Vicente Marquez and photographer Emilio Morenatti contributed to this report from Barcelona.